BMW M8 GTE Completes Inaugural North American Season With Third and Fourth Place Finishes at Motul Petit Le Mans; Edwards, Krohn, Mostert – P3, Auberlen, De Phillippi, Sims – P4. BROWNSBURG, Ind. (October 24, 2018) – Rahal Letterman Lanigan (RLL) Racing announced today that its partnership with United Rentals Inc., the largest equipment rental company in the world, has produced a total donation of $499,767 to date since 2016, the year the partnership began raising money for the Turns for Troops program to benefit SoldierStrong. The $247,767 raised to date in 2018 is close to the donations from 2016 and 2017 combined. SoldierStrong transforms the lives of military veterans by providing them with cutting-edge medical technology and access to rehabilitation. United Rentals teamed with SoldierStrong in 2016 when the equipment rental leader first became a sponsor of RLL. The annual donation has increased each year, with $100,000 raised in 2016, $150,000 in 2017 and now almost $250,000 in 2018. This year, United Rentals not only contributed $50 for each lap that Graham Rahal completed, the company also expanded its commitment to include laps completed by Rahal’s teammates, Takuma Sato and Oriol Servia, at the INDYCAR Grand Prix and Indianapolis 500 races. This resulted in a total lap count of 2,531 for 2018. 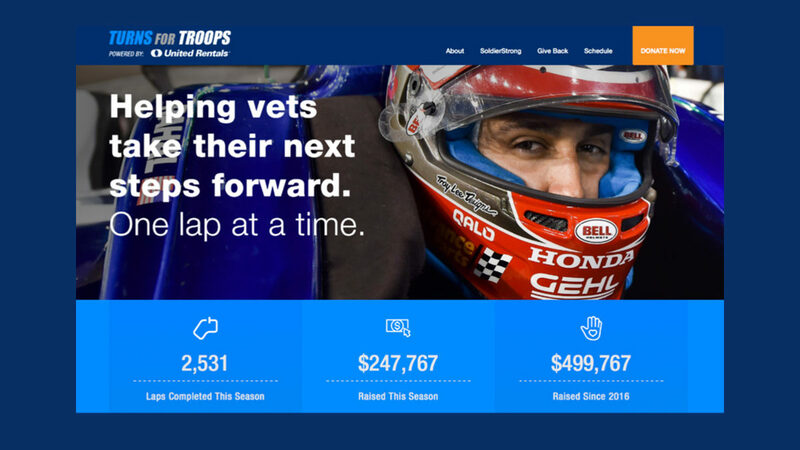 In addition, Graham Rahal reinstated his charity golf tournament in May to bolster the donation to the Turns for Troops program. The Graham Rahal Foundation split the proceeds of the tournament between Turns for Troops and another team partner, CSU One Cure, with each group receiving a $100,000 contribution. Donations from the public, together with merchandise sales and other contributions from team sponsor Fleet Cost & Care and others, further increased the year-to-date donation total in support of SoldierStrong. The Turns for Troops program will be acknowledged at the annual SoldierSalute Gala on Thursday, October 25, 2018, at The Union League of Philadelphia. The Vince and Linda McMahon Foundation will be honored and the Honorable Linda McMahon will speak at the event. The 2019 Verizon IndyCar Series season begins March 8-10 with the Firestone Grand Prix of St. Petersburg. For more details about the Series, please visit www.indycar.com or www.rahal.com. United Rentals, Inc. is the largest equipment rental company in the world. The company has an integrated network of 1,075 rental locations in North America and 11 in Europe. In North America, the company operates in 49 states and every Canadian province. The company’s approximately 16,700 employees serve construction and industrial customers, utilities, municipalities, homeowners and others. The company offers approximately 3,800 classes of equipment for rent with a total original cost of $12.9 billion. United Rentals is a member of the Standard & Poor’s 500 Index, the Barron’s 400 Index and the Russell 3000 Index® and is headquartered in Stamford, Conn. Additional information about United Rentals is available at www.unitedrentals.com. To learn more about the Turns for Troops program in support of SoldierStrong, visit www.turnsfortroops.com .